The plant pathogenic basidiomycete Sclerotium rolfsii produces the industrially exploited exopolysaccharide scleroglucan, a polymer that consists of (1 → 3)-β-linked glucose with a (1 → 6)-β-glycosyl branch on every third unit. Although the physicochemical properties of scleroglucan are well understood, almost nothing is known about the genetics of scleroglucan biosynthesis. Similarly, the biosynthetic pathway of oxalate, the main by-product during scleroglucan production, has not been elucidated yet. In order to provide a basis for genetic and metabolic engineering approaches, we studied scleroglucan and oxalate biosynthesis in S. rolfsii using different transcriptomic approaches. Two S. rolfsii transcriptomes obtained from scleroglucan-producing and scleroglucan-nonproducing conditions were pooled and sequenced using the 454 pyrosequencing technique yielding ~350,000 reads. These could be assembled into 21,937 contigs and 171,833 singletons, for which 6,951 had significant matches in public protein data bases. Sequence data were used to obtain first insights into the genomics of scleroglucan and oxalate production and to predict putative proteins involved in the synthesis of both metabolites. Using comparative transcriptomics, namely Agilent microarray hybridization and suppression subtractive hybridization, we identified ~800 unigenes which are differently expressed under scleroglucan-producing and non-producing conditions. From these, candidate genes were identified which could represent potential leads for targeted modification of the S. rolfsii metabolism for increased scleroglucan yields. The results presented in this paper provide for the first time genomic and transcriptomic data about S. rolfsii and demonstrate the power and usefulness of combined transcriptome sequencing and comparative microarray analysis. The data obtained allowed us to predict the biosynthetic pathways of scleroglucan and oxalate synthesis and to identify important genes putatively involved in determining scleroglucan yields. Moreover, our data establish the first sequence database for S. rolfsii, which allows research into other biological processes of S. rolfsii, such as host-pathogen interaction. The basidiomycete Sclerotium rolfsii is a soilborne plant pathogenic fungus causing diseases in many agricultural and horticultural plants [1–3]. However, it is also used in biotechnology as a microbial platform for the production of the exopolysaccharide (EPS) scleroglucan. This polysaccharide is a water-soluble homopolymer composed of a (1 → 3)-β-linked glucopyranose backbone with single (1 → 6)-β-linked glucopyranosyl branches on every third subunit  and traded under the commercial names Tinocare® GL and Actigum®. Scleroglucan shows remarkable rheological properties rendering the substance as a multipurpose compound for many industrial applications, ranging from oil recovery over food industry to cosmetics and medical applications [5–7]. Surprisingly, only very little information is available on the biosynthesis of scleroglucan formation by S. rolfsii [4, 7, 8] whereas the physicochemical properties of scleroglucan are well explored [7–11]. According to theoretical considerations put forward by Sutherland [11, 12], scleroglucan synthesis follows the general scheme for polysaccharide production in microbial systems in three major steps: substrate uptake, intracellular formation and extrusion from the cell. 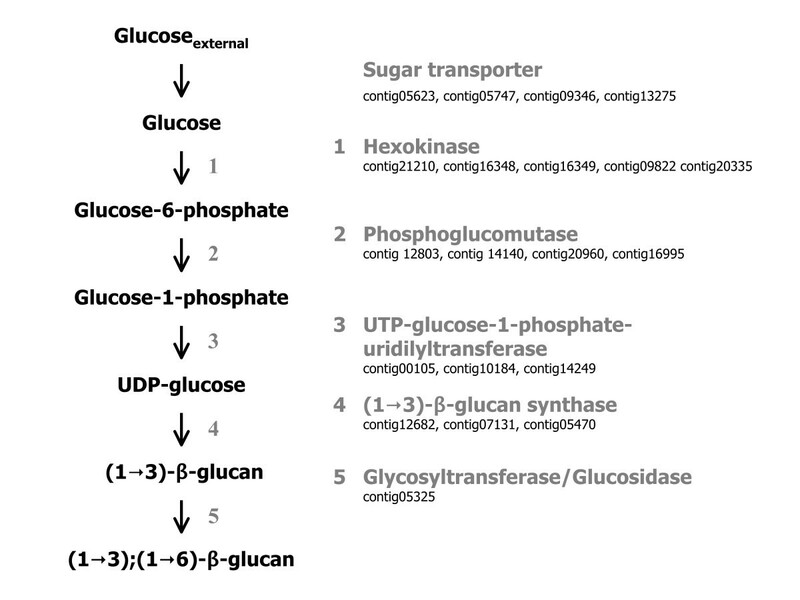 Uptake of glucose into the cell is mediated by glucose transporter(s), followed by phosphorylation of glucose to glucose-6-phosphate via a hexokinase reaction (EC: 2.7.1.1). After interconversion of glucose-6-phosphate to glucose-1-phosphate by phospho-glucomutase (EC: 2.7.5.1), a UTP-glucose-1-phosphate uridylyltransferase (EC: 2.7.7.9) activates glucose-1-phosphate to UDP-glucose. A (1 → 3)-β-glucan synthase (EC: 2.4.1.34) polymerizes the backbone chain using UDP-glucose as monomeric precursor. The last step yielding to the (1 → 6)-β branching at every third glucose molecule is supposed to be catalyzed by trans-D-glucosidases . 14C incorporation experiments evidenced that the (1 → 3)-β chain of scleroglucan is elongated toward the non-reducing terminus and that (1 → 6)-β-linked glycosyl side residues are incorporated simultaneously as the (1 → 3)-β-glucan backbone is elongated [13, 14]. Several empirical studies have been performed to identify optimum medium composition for EPS production by S. rolfsii [15–21]. Interestingly, medium conditions favoring scleroglucan production have been reported to increase the amount of secreted oxalate as well [22, 23]. The biosynthesis of scleroglucan has thus been proposed to be closely linked to the synthesis of oxalate; a reducing agent and strong acid involved in the infection process of S. rolfsii [24, 25]. During industrial scleroglucan production, however, the formation of the by-product oxalate is undesirable as it lowers the productivity of the process and negatively interferes with downstream processing of scleroglucan [7, 18]. For some of its applications, e.g. in cosmetics and food industry, a cost intensive removal of oxalate is necessary. Microbial oxalate is assumed to be synthesized in the glyoxylate cycle (GLOX), which is the anaplerotic pathway during growth on C2-carbon sources. Glyoxylate and succinate are the products of the isocitrate lyase reaction, and glyoxylate is either further oxidized to oxalate via the glyoxylate oxidase or used as precursor for malate synthesis. Although for basidiomycetes the cellular role of oxalate is still not clarified, it has been reported to be important for free radical formation, iron and calcium chelation as well as pectin and cellulose hydrolysis [26–29]. In phytopathogenic fungi, oxalate has been described as a very important factor contributing to fungal virulence. One role of oxalate is to lower the pH of the ambient environment, resulting in increased fungal polygalacturonase activity necessary for plant cell wall degradation [23, 27, 28]. Other roles include sequestration of calcium from cell walls, hydrolysis of plant pectin, suppression of plant defense responses and induction of the programmed cell death in plants [30–32]. Understanding the genetic basis for scleroglucan and oxalate biosynthesis is a prerequisite for the design of genetically engineered strains with improved scleroglucan yields. However, the genome of S. rolfsii has not been sequenced yet and DNA sequences have been published for only a few S. rolfsii genes. To overcome this obstacle, we applied the massively parallel short-read 454 pyrosequencing technology to sequence the transcriptome of S. rolfsii. From the assembled and annotated unigene sequences, we predicted genes particularly involved in EPS and oxalate metabolism. Additionally, we performed a global suppression subtractive hybridization (SSH) approach to isolate and identify genes up-regulated under scleroglucan-producing conditions. We used the sequence data obtained from the 454 sequencing and from the SSH approaches to finally develop Agilent microarray chips to perform comparative gene expression profiling for S. rolfsii grown in scleroglucan-producing and scleroglucan-nonproducing conditions and to identify genes differentially expressed under both conditions. A basic requirement for this work was the development of two cultivation media for S. rolfsii, which should provide sufficient growth and a comparable biomass production, however with significant differences in EPS production. In order to identify such media compositions, we used the synthetic EPS medium proposed by Farina et al , and altered both the nature and concentration of the carbon (glucose, fructose, sucrose; 25-220 mM) and nitrogen (NH4Cl, NaNO3, (NH4)2SO4; 17-280 mM) sources. S. rolfsii was cultivated in these media and the formation of scleroglucan and oxalate was monitored over time (data not shown). As shown in Figure 1A, scleroglucan production was high in medium containing 220 mM Glc and 35 mM NaNO3 (designated EPSmax13) and lower in medium containing 220 mM Fru and 35 mM NH4Cl (designated EPSmin17). At 30 h of cultivation, S. rolfsii produced scleroglucan in EPSmax13 medium but to a slightly lesser extent in EPSmin17 medium. Sufficient amounts and significant differences in scleroglucan production are detectable after 37 h of cultivation, whereas biomass accumulation was comparable. We thus decided to choose the 37 h time point for the comparative analysis. 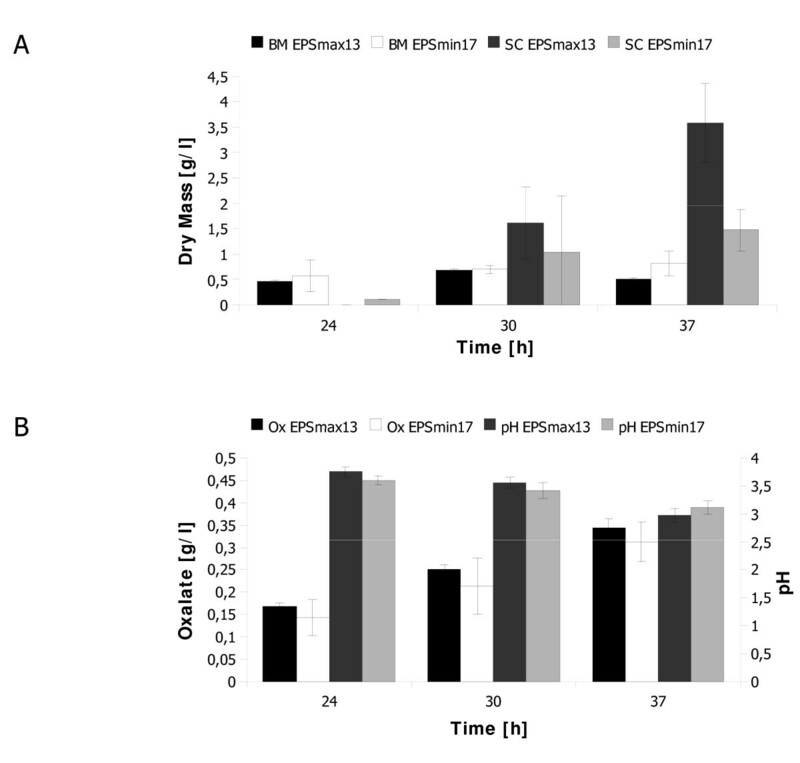 Interestingly, cultures of S. rolfsii grown in EPSmax13 and EPSmin17 media displayed similar pH and oxalate profiles, suggesting that oxalate production is rather coupled to growth and biomass formation than to scleroglucan synthesis (Figure 1B). Growth of S. rolfsii and metabolite production in EPSmax13 and EPSmin17 medium. S. rolfsii was cultivated in 50 ml medium at 28°C up to 37 h. Cultures were harvested at the time points indicated, and the dry weight biomass (BM), scleroglucan (SC), oxalate and the medium pH determined. Mean values of a biological duplicate experiment are shown. Total RNA extracted from 37 h old cultures of S. rolfsii grown in EPSmin17 and EPSmax13 medium were pooled in a 1:1 ratio to guarantee equal predominance of both RNA populations and subsequently reversed transcribed into cDNA. The mixed cDNA sample was sequenced by 454 Life Sciences™. The rationale behind combining both mRNA populations was to increase transcriptome coverage. Triplicate sequencing runs resulted in 356,098 single reads composed of 3.68 million bases (Table 1). Using the 454 Life Sciences™ Newbler software, these reads were trimmed and assembled into 21,937 contiguous sequences and 171,833 singletons (Table 1, Additional file 1) and are later on referred to as unigenes. A complete list of all unigenes has been deposited at the NCBI Sequence Read archive (SRA, http://www.ncbi.nlm.nih.gov/sra) under accession number SRA012273.1. Sequencing, assembly and data analysis. All unigenes obtained were functionally analyzed via the S equence A nalysis and M anagement S ystem (SAMS). This software platform was originally developed to support the computational analysis of shotgun genome sequencing projects . However, in addition to quality assessments, SAMS is well suited for the annotation of short sequence fragments and as an annotation pipeline also includes standard bioinformatics tools such as BLAST . We thus used SAMS to analyze and functionally annotate the S. rolfsii unigenes. The analysis pipeline was set up with different BLAST tools and databases: BLAST2× versus the NCBI NR protein database (E-value cut-off of 10-5), BLAST2× versus the KOG protein database (E-value cut-off of 10-5), BLAST2n versus the NCBI NT nucleotide database (E-value cut-off of 10-5) and TBLASTx2 versus the NCBI NR/NT database, E-value cut-off of 10-5). The EuK aryotic O rthologous G roups database (KOG) is essentially the eukaryotic version of the C lusters of O rthologous G roups database (COG; http://www.ncbi.nlm.nih.gov/COG/). A total of 6,951 sequences were assigned to one or more KOG functional categories. The remaining sequences were excluded by the chosen cut-off E value of 10-5. To evaluate the completeness of the transcriptomic data collection, we searched the unigenes for the presence of genes predicted to function in four primary carbon metabolic pathways - glycolysis, pentose phosphate pathway, TCA and glyconeogenesis. Annotated sequences were found for every step of the four pathways (data not shown), suggesting that the transcriptomic library could represent a nearly complete sequence database for the S. rolfsii transcriptome. The annotated unigene functions cover a broad range of KOG categories (Figure 2, Additional file 2), with the majority of genes grouping into the metabolism category. Among the functional KOG categories, we were particularly interested in the categories 'Carbohydrate transport and metabolism (G)' and 'Energy production and conversion (C)' as they were supposed to contain unigenes which participate in scleroglucan and oxalate metabolism. An overview of all unigenes allocated into both categories is given in Additional file 3. 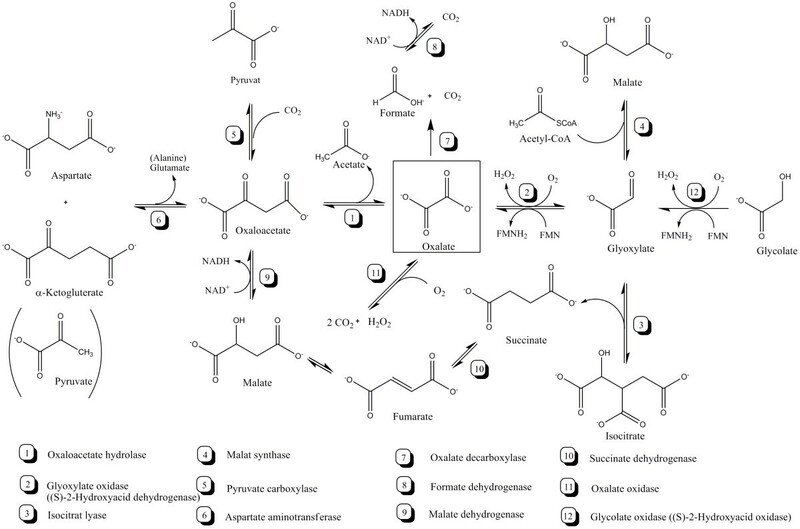 From this list, unigenes were selected which could potentially be involved in each of the five steps of scleroglucan biosynthesis (Figure 3). Surprisingly, only one potential candidate glycosyltransferase, presumed to catalyze the last step in scleroglucan synthesis, was identified. Lacking more direct hits, we screened the complete 171,833 singletons for the presence of a predicted glycosyltransferase unigene and retrieved one additional positive hit (D6LAZMP02HU01 M, 109 bases). KOG categorization of S. rolfsii unigenes. Categories are abbreviated as follows: J, translation, ribosomal structure and biogenesis; K, transcription; L, replication, recombination and repair; A, RNA processing and modification; B, chromatin structure and dynamics; D, cell cycle control, cell division, chromosome partitioning; O, posttranslational modification, protein turnover, chaperones; N, cell motility; P, inorganic ion transport and metabolism; T, signal transduction mechanisms; Z, Cytoskeleton; Y, Nuclear structure, M, cell wall/membrane/envelope biogenesis; V, defense mechanisms; C, energy production and conversion; G, carbohydrate transport and metabolism; E, amino acid transport and metabolism; F, nucleotide transport and metabolism; H, coenzyme transport and metabolism; I, lipid transport and metabolism; Q, secondary metabolites biosynthesis, transport and catabolism; R, general function prediction only; S, function unknown. Candidate unigenes potentially involved in scleroglucan biosynthesis. Unigenes with predicted functions in one of these steps are indicated with their contig code. With respect to oxalate metabolism, we could retrieve matching unigenes for 9 out of 12 possible enzymatic reactions (Figure 4 and Table 2). As three hits potentially encode an oxaloacetate hydrolase (reaction 1 in Figure 4) but none a glyoxylate oxidase (reaction 2 in Figure 4), it can be suggested that the main route for oxalate synthesis in S. rolfsii is via oxaloacetate. This would be in good agreement with previous findings which demonstrated that the most important pathway leading to oxalate formation in asco- and basidiomycetes is catalyzed via an oxaloacetate hydrolase and thus solely depends on oxaloacetate as precursor and not on glyoxylate [35–37]. On the other hand, it has been reported for S. rolfsii that the enzyme glycolate oxidase (reaction 12 in Figure 4) also accepts glyoxylate as substrate and oxidizes it to oxalate [20, 38]. Four contigs show considerable homology to glycolate oxidases (Table 2), which thus could be candidate genes for such an enzyme. Biochemical pathways involved in microbial oxalate metabolism. 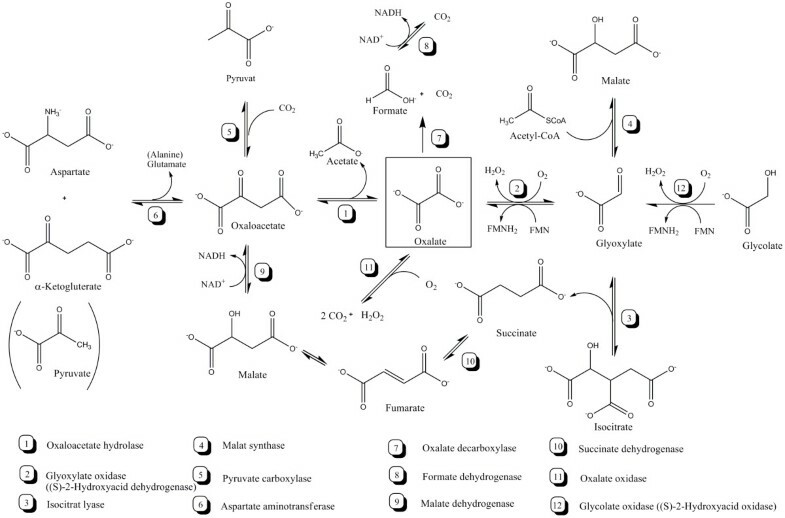 A literature survey of microbial and especially fungal oxalate metabolism was conducted to obtain an inventory of all possible metabolic routes for oxalate synthesis and degradation. Unigenes with predicted functions in one of these steps are indicated with their contig code in Table 2. Unigenes with predicted enzyme function related to oxalate metabolism. → Summary of the S. rolfsii contigs giving at least one hit when analyzed with one of the four BLAST tools (E-value cut-off of 10-5) to the enzymes catalyzing reactions 1-12 according to Figure 4. In terms of oxalate degradation, no hits were identified for an oxalate oxidase (reaction 11 in Figure 4) and an oxalate decarboxylase (reaction 7 in Figure 4), but several unigenes matched a formate dehydrogenase (reaction 8 in Figure 4). We propose two possible explanations for this finding. Either the main pathway for oxalate degradation is still the oxalate decarboxylase -- formate dehydrogenase route but the oxalate decarboxylase gene was expressed on a very low level and therefore not found among the mRNA population(s) used for sequencing. Or S. rolfsii does not use the oxalate decarboxylase -- formate dehydrogenase pathway for oxalate degradation and the formate dehydrogenase enzyme rather has a function in anaerobic respiration as shown for Fusarium oxysporum [39, 40]. As the lack of detection for unigenes encoding for an oxalate oxidase and oxalate decarboxylase could be due to their low expression levels, we screened the genomic DNA of S. rolfsii via PCR using primers designed from respective fungal and plant gene sequences (see Methods). Basically, either one of both enzymes have been reported to be present in basidiomycetes, e.g. an oxalate oxidase is crucial for lignin degradation by the white rot fungus Ceriopsis subvermispora  and a oxalate decarboxylase is important for the brown rot fungus Flammulina velutipes for the survival under low external pH conditions . All our PCR attempts to isolate a DNA sequence encoding an oxalate degrading enzyme were only successful for an oxalate oxidase but not for an oxalate decarboxylase (data not shown). We were able to isolate one DNA fragment (designated oxox), which showed 32% similarity to the barley oxoX gene, suggesting that the oxalate oxidase reaction is the likely oxalate degradation route in S. rolfsii. We used a s uppression s ubtractive h ybridization (SSH) approach to isolate cDNA species which are only present or enriched in S. rolfsii when grown in EPSmax13 medium compared to EPSmin17 medium. The advantage of the SSH approach is that also low abundant mRNA species can be isolated. The mRNA isolated from S. rolfsii cultivated for 37 h in EPSmax13 medium was used as 'tester' and mRNA isolated from 37 h old S. rolfsii cultures cultivated in EPSmin17 medium served as 'driver'. A total of 400 transformants representing cDNAs induced under scleroglucan-producing conditions were isolated. 180 of these clones were randomly selected and screened by reverse Northern hybridization for differential expression (Figure 5 and data not shown). 49 of the 180 screened cDNA clones showed considerable differences when hybridized with total cDNAs from scleroglucan-producing and scleroglucan-nonproducing conditions, respectively, confirming that these genes are up-regulated during scleroglucan biosynthesis. 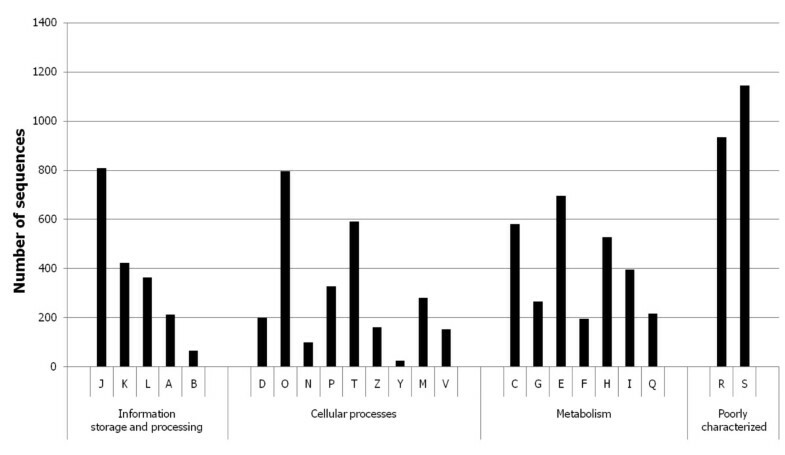 The 49 differentially expressed cDNAs were sequenced (Additional file 4), analyzed via TBLASTx and assigned to their predicted functional activity within different biochemical pathways (Table 3). In addition, the BioEdit tool http://www.mbio.ncsu.edu/BioEdit/bioedit.html was applied to blast and align the SSH unigenes against the 21,937 contigs identified via 454 sequencing (E-value cut-off of 10-5). For the majority of the SSH unigenes, we could identify homologous 454 unigenes (Table 3). Reverse Northern hybridization. A, Flowchart of the Reverse Northern analysis. B, cDNA clones enriched in EPSmax13 were spotted via slot blot technique on two nylon membranes and then hybridized with total cDNAs derived either from EPSmax13 (upper panel) or EPSmin17 (lower panel). C, as reference, the same membranes were hybridized with vector-DNA to normalize probe intensities. Differentially expressed genes are marked by a red frame. Unigenes identified via SSH and Reverse Northern hybridization that display increased expression in EPSmax13 medium. * The DNA sequences of all SSH unigenes are given in Additional file 4. Interestingly, we isolated not only genes predicted to function in scleroglucan and oxalate metabolism (e.g. UTP-glucose-1-phosphate uridylyltransferase, two aspartate aminotransferases, and two formate dehydrogenases) but also genes known to play fundamental roles in primary metabolism. For example, pyruvate decarboxylase (marker enzyme for oxygen limitation), isocitrate dehydrogenase (key enzyme of TCA), oxoglutarate dehydrogenase (enzyme of TCA and key enzyme for ammonia assimilation), acyl-CoA-dehydrogenase (first and rate-limiting step of fatty acid oxidation) and glycogen phosphorylase (crucial for survival under low energy supply) were among the predicted proteins. Complementary to the SSH approach; we performed gene expression profiling to identify genes up- and down-regulated during scleroglucan-producing conditions. In order to manufacture respective Agilent microarrays, ten different 60 bp long probes were designed (Additional file 5) and in situ synthesized for all of the 454 and SSH unigenes (~22,000). The specificity of the probes was analyzed in a test hybridization run using pooled cDNA populations from S. rolfsii cultivated for 37 h in EPSmax13 and EPSmin17 medium (data not shown). Based on the results, two probes per unigene were selected for the design of Agilent Multiplex 44K Arrays (Additional file 6). The arrays were hybridized with S. rolfsii cDNA, obtained from 37 h cultivations in EPSmax13 and EPSmin17 medium, respectively. Hybridizations were performed in triplicate using mRNA isolated from three independent cultures (biological triplicate, Additional files 7, 8, 9, 10, 11, 12 and 13). After normalization based on quantiles, hybridization clustering experiments were performed to control both experimental conditions. Based on this quality check, we had to exclude one of the triplicate samples from further analysis (EPSmin17 experiment, Sample B) as it did not cluster with the other two EPSmin17 samples (Additional file 14). For the comparison of the EPSmax13 triplicate versus the EPSmin17 duplicate arrays, we used an arbitrary chosen fold change of 2 to define unigenes as differently expressed (Students t-test; p < 0.05). Applying this filter, expression of a total of 723 unigenes did significantly vary between both conditions, whereby 356 unigenes were up- and 367 down-regulated under EPSmax13 condition when compared to the EPSmin17 condition. A comprehensive list of all differentially expressed unigenes is depicted in the Additional file 15. As not all of the 723 unigenes displayed a KOG annotation, we manually re-annotated this gene list using TBLASTx or BLASTN (E-value cut-off of 10-5) and classified the predicted protein functions according to the Functional Catalogue (FunCat) . We could thereby assign putative FunCats to 267 unigenes, out of which 138 were up-regulated and 129 down-regulated in S. rolfsii when cultivated in EPSmax13 medium (Additional file 15, Figure 6). Functional categories of genes up- or down-regulated in S. rolfsii grown in EPSmax13 medium compared to growth in EPSmin17 medium. An annotated list of all responsive genes, including fold change, p value and classification, can be found in Additional file 15. 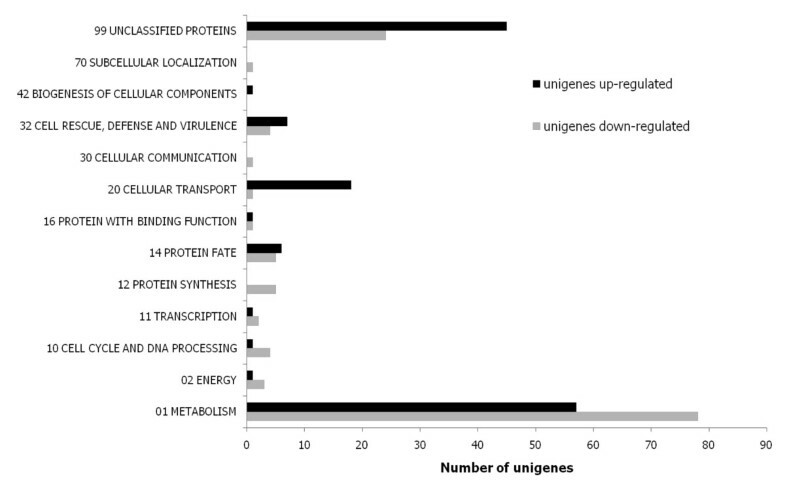 The functional categories with the largest number of differently expressed unigenes are the categories 'Metabolism' and 'Transport' (Figure 6). Among these are four unigenes which we had isolated via the SSH approach (e.g. glycogen phosphorylase, UDP-glucose-4-epimerase, formate dehydrogenase; Table 4). The high fold change cut-off used for microarray analysis as well as the lower sensitivity of microarrays compared to SSH probably limited the amount of overlapping hits. Nine unigenes predicted to encode polysaccharide-acting enzymes were up-regulated when S. rolfsii was cultivated in EPSmax13 medium (Table 4), thus representing potential candidate genes involved in scleroglucan elongation and branching. Moreover, many up-regulated unigenes fall into the group of ergosterol and sphingolipid metabolic proteins (Table 4). Finally, various unigenes assigned to transporters (ions, amino acids, peptides, lipids) and oxidoreductases (e.g. aryl-alcohol dehydrogenases) displayed altered expression under EPSmax13 conditions (Additional file 15). These transcriptional changes could imply that scleroglucan synthesis might be coupled to the cellular ion homeostasis machinery. Such a scenario would be in agreement with the overall concept that microbial EPS production is also an adaptive response towards environmental salt and osmotic stress [44–47]. Unigenes selected from the microarray analysis that display increased or reduced expression in EPSmax13 medium compared to EPSmin17 medium. In this study, we used different strategies to reveal genes involved in scleroglucan synthesis and oxalate metabolism of Sclerotium rolfsii, a fungus that lacks a sequenced genome. In sum, three independent transcriptomic approaches were applied, which together uncovered candidate genes for each predicted step of scleroglucan synthesis, oxalate synthesis and oxalate degradation. Many of these genes were unraveled in both global comparative transcriptomic analyses, making them as prime candidates for further analyses. The insights into the genetics and transcriptome of scleroglucan synthesis obtained in this work are to our knowledge the first gained for any EPS produced by a basidiomycete. The sequence data covers a nearly complete set of genes transcribed in S. rolfsii and provides an important resource for studying the biology and pathogenesis of S. rolfsii. S. rolfsii strain ATCC15205 was cultivated at 28°C in shake flasks containing 50 ml EPS medium (C-source, N-source, 2 g/l K2HPO4, 0.5 g/l KCl, 0.5 g/l MgSO4*7H2O, 0.05 g/l FeSO4*7H2O, 1 g/l yeast extract, 0.7 g/l citric acid 7*H2O. pH 4.5) . EPSmax13 contained 40 g/l glucose and 3.0 g/l NaNO3 as C- and N-sources, whereas EPSmin17 used 40 g/l fructose and 1.9 g/l NH4Cl, respectively. In order to determine S. rolfsii biomass from liquid cultures, 40 g of each culture broth were sampled, preheated to 56°C and subjected to enzymatic cell wall degradation (1 mg Glucanex/g broth). After incubation for 30 min at 56°C, Glucanex was heat-inactivated (90°C, 20 min) and the sample cooled down to room temperature. The initial weight (40 g) was re-adjusted by adding water and 30 g of this solution were centrifuged to harvest the biomass. The dry weight was determined after the wet biomass pellet was vacuum-dried over night (12 h, 60°C). Scleroglucan levels were determined using isopropanol precipitation. Two volumes of isopropanol were mixed with one volume of culture broth and the resulting scleroglucan precipitate was filtered over a 74 μm mesh filter. After evaporation of isopropanol, the precipitate was vacuum-dried for 2 h at 60°C and the dry weight of scleroglucan determined. Oxalate levels in the culture supernatant were determined via HPLC (Knaur column H+) using 0.05 M H2SO4 as solvent and an UV detector (210 nm). Due to the high amounts of EPS produced, extraction of intact total RNA from S. rolfsii cultures was only possible by using a caesium chloride-based ultracentrifugation method . In brief, 1 g of S. rolfsii mycelium was harvested by filtration and frozen in liquid nitrogen. After homogenization using a dismembrator (Braun Biotech), the pulverized homogenate was resuspended in 5 ml RNA extraction buffer (4 M guanidine isothiocyanate; 0.1 M Tris/HCl, pH 7.5; 1% β-Mercaptoethanol, 0.5% N-laurylsarcosine). After centrifugation (5000 ×g, 10 min, RT), the supernatant was subjected to ultracentrifugation using 5 M caesium chloride (30,000 ×g, 19 h, RT). The resulting RNA pellet was precipitated using 2 volumes of ice-cold EtOH (96%) and 1/10 volumes of 8 M LiCl. Suppression subtractive hybridization was performed using the PCR-SelectTM cDNA subtraction kit and followed the manufacturer's instructions (Clontech). S. rolfsii mRNA extracted from EPSmax13 cultures was used as tester (mRNA population containing specifically expressed transcripts) and mRNA isolated from EPSmin17 as driver (mRNA population that is used for subtraction). The tester cDNAs enriched under EPSmax13 conditions were ligated into pUC18 vector (Fermentas) and transformed into Escherichia coli DH5α (Gibco). Selected transformants were subjected to Reverse Northern analysis. Plasmid DNAs isolated from 180 randomly picked clones were slot-blotted onto positively Hybond-N nylon membranes (Amersham) and subjected to three independent hybridization runs using P32-labelled cDNAs generated from EPSmax13 and EPSmin17, respectively, as well as pUC18 plasmid DNA as probes. cDNAs were generated using Superscript II reverse transcriptase (Ambion). Hybridizations were performed using the Rapid-Hyb buffer system (Amersham) and followed the manufacturer's instructions. Mixed cDNA populations obtained from S. rolfsii were sequenced in triplicate runs by 454 Life Sciences (Branford, USA). For this purpose, total RNA was isolated from 37 h old cultures of S. rolfsii grown in EPSmin17 and EPSmax13 medium (see above). Both RNA populations were pooled in a 1:1 ratio to guarantee equal occurrence and putative constitutively expressed genes (glycerol phosphate dehydrogenase, gpdS; glucoamylase G2, accession number D49448) were used for normalization. cDNAs were synthesized using the Clontech's SMART System protocol modified by AGOWA (Berlin, Germany). The cDNA library was sequenced by the ultrafast pyrosequencing method (454 Life Sciences). Oxalate oxidase metabolizes oxalate directly to CO2 and H2O2 (enzyme no. 11 in Figure 4) and is found mainly in plants [49–51] but also in basidiomycetes . Sequences from barley (oxoX, CAA74595) and the fungus Ceriopsis subvermispora (CAD91553) were used to identify regions of high homology (data not shown), inside of which primers were designed (Bar 1, GGTACGAACACGTGGGC; Bar2, CCGGCCTCCACCCGAAGAG) to amplify a potential oxalate oxidase from S. rolfsii genomic DNA (see below). Using this primer pair, a ~850 bp fragment was isolated. Oxalate decarboxylase degrades oxalate to formate and CO2 (enzyme no. 7 in Figure 4). Oxalate decarboxylases are present in the brown rot fungi Postia placenta  and Flammulina velutipes . A region within the F. velutipes oxdc gene (AF200683), which is highly conserved among oxalate decarboxylases, was used as a template for the design of specific primers (Oxdc1, ATTAAGGATCCATCCATCGCATTTCCGATG; Oxdc2, AATACCDAYGTAGGAAATCATATCCGGCCG). For both PCR reactions, different annealing temperatures and elongation times were tested (not shown). S. rolfsii was cultivated in 100 ml EPSmin17 medium at 28°C, 250 rpm using magnetic stirrers. After 48 h of cultivation, mycelium was harvested by filtration through a piece of gauze and washed twice with hot water (85°C) to remove scleroglucan. The mycelium was frozen in liquid nitrogen and genomic DNA extracted following a protocol described for Aspergillus nidulans . Tailor-made microarrays (44K multiplex chip, Agilent) were designed by imaGenes (Berlin, Germany) using an in-house developed method for empirical selection of best performing probes for each gene (Pre Selection Strategy). Briefly, up to ten probes were designed for each of the 454 and SSH unigenes as well as for the oxox gene (60 bp long oligomers). The 244K Agilent test array was hybridized with pooled Cy3-labeled cRNAs gained form EPSmax13 and EPSmin17 cultures (see above) and (in average) two of the best performing oligos were selected for each unigene. For comparative expression profiling, total RNA was isolated from S. rolfsii, cultured for 37 h in EPSmax13 and EPSmin17 media as described above. RNA quality control, synthesis of Cy3-labeled cRNA including cRNA purification and cRNA quality control, microarray hybridization, scanning and data extraction (Agilent's feature extraction software) were performed by imaGenes GmbH. The complete set of transcriptional raw data is available as Additional files 8, 9, 10, 11, 12 and 13 and has additionally been archived at Gene Expression Omnibus http://www.ncbi.nlm.nih.gov/geo under accession number GSE21040. Expression data were analyzed by imaGenes GmbH using an in-house developed data analysis pipeline. After quantile normalization, genes were defined as differentially expressed if their expression levels varied at least 2 fold in EPSmax13 samples compared to EPSmin17 samples and if the difference was statistically significant (Student's t-test, P-value cut-off of 0.05). The authors would like to thank Barbara Walewska, Boris Winter and Mirine Choi for technical assistance and the German Federal Ministry of Research and Education for financial support (BMBF grant 0313397). JS carried out the molecular genetic studies, sequence annotations and microarray analyses and performed the oxalate analyses. LF and JS carried out the SSH approach and extracted RNA and scleroglucan. TB participated in the bioinformatics and functional analyses. JS, DM and US participated in the design of the study. VM and VS conceived of, designed and coordinated the study. JS and VM wrote the manuscript. All authors read and approved the final manuscript.